If you're already familiar with Planet Mu's Ital Tek, it might strike you as odd that this EP was his doing at all. Compared to the borderline-ambient feel of his older dubstep works, Gonga, released December 5, takes a new direction entirely, bringing four fantastic tracks that all have something unique and worthwhile to offer. While his older works, with their melodic, lush nature, were more up my personal taste-alley ("Babel" has to be one of my favorite tracks of all time), this EP still maintains the signature feel of Ital Tek while exploring something totally different. 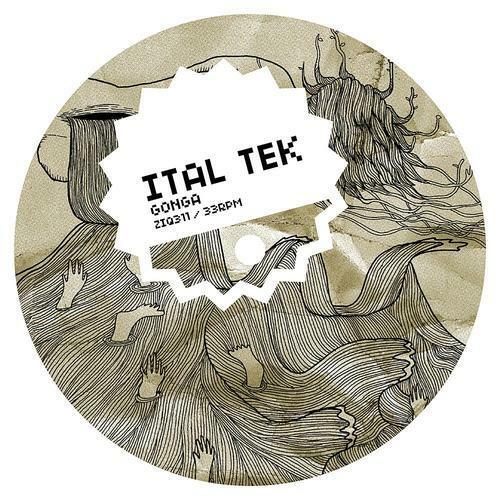 The first and final tracks, "Gonga" and "Cobalt", are more fast-paced, danceable tracks than what we've see from Ital Tek in the past but definitely feels up with the times, taking trends from various electronic fellows like Machinedrum and giving them Ital Tek's own touch (these aren't simply following trends, but they are up to date on what the innovators have been doing with their time). µ-Ziq's remix of the title track is even quicker and more chaotic, with an R&B vocal sample (how Night Slugs-y of him) brought into the blend of sounds. "Pixel Haze" is more like what one one expect from Ital Tek; it's a swirling mix that feels beautiful but still a bit heavy and dangerous; it's not over-encumbered and heavy, but it's still multidimensional. What all of these tracks share is that they call for multiple listens; nothing here is completely simple and predictable. The tracks take turns that are unexpected without feeling forced or uncomfortable. That's what I love about Ital Tek. Jlin Drops new 'Dark Lotus' track "Nyakinyua Rise"